Horizon Vault & Monument Company is located in Elba, Alabama and we service Coffee, Geneva, Covington, Crenshaw, Pike, Dale, Barbour, Henry, and Houston counties. We offer a full range of cemetery service to include burial vaults with set-up, custom headstones, coping, slabs, cremation options, as well as renovation of existing cemetery work. Our dedicated staff is committed to offering the finest in quality memorials and provided the best service anywhere. Horizon Vault & Monument Company is owned and operated by Heath Wyrosdick. 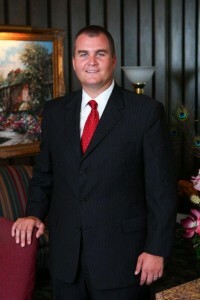 Heath Wyrosdick, owner of Horizon Vault and Monument Company. Horizon Vault and Monument Company grew out of a need for a funeral and memorial service that could be trusted to stand by their clients throughout the burial arrangement processes. Our slogan, “Caring service when it matters the most” has defined our dedication from the very beginning to offering quality service that our clients can rely on during trying times. This commitment to excellence has developed Horizon Vault and Monument into what is now the fastest growing business of its kind in southeast Alabama. Heath has a background in funeral service, and understands the importance of providing lasting impressions for the families his company serves. Death of a loved one is often referred to as the darkest hours of a person’s life and is no time to have to deal with further complications brought on by retailers. We strive to create positive memories for the families we serve, and to build lasting memorials that pay tribute to and celebrate the lives they lived.